Front hubs only fail this way when a fundamental wheel building mistake is made. Imagine my surprise when my front wheel started wobbling while riding down the steep, twisty Metcalf Road in south San Jose. When I reached the bottom I noticed the hub had failed and two spokes were loose. Years ago I re-built this wheel and made a fundamental mistake. I had been warned by Jobst Brandt, author of The Bicycle Wheel, to rebuild the hub with the same spoke-to-hub orientation as the previous build. After the first set of 18 inbound spokes in a 36-spoke wheel are installed, you add nine outbound spokes on the other side of the hub and flip the wheel over. At this point you insert the spokes into the rim. After that you twist the hub; the spoke closest to the rim’s valve hole twists away from the hole. 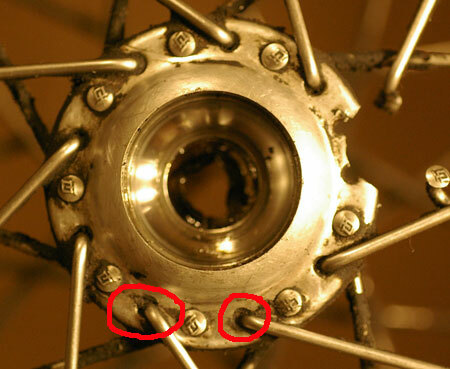 After riding the wheel for a time, the outbound spokes seat against the aluminum hub and eventually cause an indentation. See the red circles showing the indents. By re-spoking and seating the spokes such that they’re not resting in the original indent, the hub is compromised. Adding another gouge in the hub can lead to failure. Sure enough, Jobst was right. Lesson learned and a perfectly good Campagnolo hub trashed. Sigh. This entry was posted on November 3, 2011 at 7:34 pm and is filed under Repair. You can follow any responses to this entry through the RSS 2.0 feed. You can leave a response, or trackback from your own site.